Shaping Opinion | People, events and things that have shaped the way we think. Hockey Hall of Fame curator and Keeper of the Cup Philip Pritchard joins Tim to talk about the history and lore of the Stanley Cup and how it’s unique among all professional sports trophies with its own personality, and the stories it could tell. Wherever the Cup goes, Phil goes with it as the Keeper of the Cup. Executive Director of the Builders Guild of Western Pennsylvania Jeff Nobers joins Tim to talk about the rising career opportunities for people without four-year degrees, and who don’t mind rolling up their sleeves and going to work. Historian, author and Heritage Foundation Distinguished Fellow Lee Edwards joins Tim to talk about the Berlin Wall, the world that created it, the Cold War that fostered it, and the free world that brought it down. Author and historian Tom McMillan joins Tim to talk about the Civil War history of Gettysburg, Pennsylvania and why it still matters in the 21st Century. If the outcome were different, there could be up to five different countries between the Atlantic and Pacific oceans. Space author, journalist and historian Rod Pyle joins Tim to tell the story you knew and the ones you didn’t about the pinnacle accomplishment for the NASA space program, when man first stepped foot on the Moon thanks to Apollo 11, which is celebrating its 50th anniversary in 2019. Rolling Stone journalist Andy Greene joins Tim to talk about plans to mark the 50th anniversary of Woodstock and the legacy across generations left by that iconic original event in 1969. The president of the Marcellus Shale Coalition joins Tim to talk about just how game-changing a somewhat recent innovation in the energy industry could be. While hydraulic fracturing isn’t new, how it was used to tap previously unreachable oil and gas reserves was an innovation that changed the energy future of the nation. 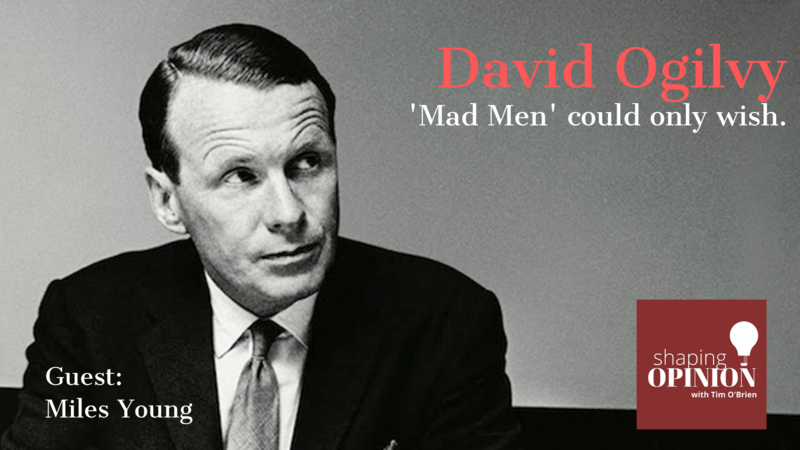 Former Chairman and CEO of global communications firm Ogilvy & Mather Miles Young joins Tim to talk about David Ogilvy, a legend in the advertising world and just why Ogilvy’s legacy continues to be felt far and wide. Jen Chaney joins Tim to talk about a cult classic film that its fans have to watch over and over. Ferris Beuller’s Day Off. Jen is a TV critic and pop culture journalist who’s contributed to the Washington Post, the New York Times, New York Magazine’s Vulture specialty publication, and WTOP Radio in Washington, D.C. In this episode we talk about how a teen movie left an indelible mark on pop culture. Dr. Cyril Wecht, a world-renowned forensic pathologist joins Tim to talk about his long experience with his study of the John F. Kennedy assassination. Dr. Wecht was among the first to raise concerns over the investigation of the assassination. In this episode, we talk with Dr. Wecht about the events of November 22, 1963, the story that was told to the world, and the story that has started to emerge in the 55 years since. Author Blake Harris joins Tim to discuss the story behind his book, which is being turned into a television series: “Console Wars: Sega, Nintendo, and the Battle That Defined a Generation.” Blake tells the story of when Sega and Nintendo battled Nintendo throughout the 1990s for video game industry dominance, and for the hearts, minds, and the fingers of a new generation. Fellow crisis communicator Jeff Worden joins Tim to talk about one of the worst crises NASA ever faced when the space shuttle Challenger came apart in midair shortly after launch in front of millions. Liz Dolan joins Tim to talk about one of the most well-known advertising taglines of all time, Nike’s “Just Do It.” Liz was Nike’s head of PR and then Marketing for the ten years when the legendary changed everything for the company and the way companies market themselves. We talk with Liz about the story behind Nike’s marketing genius, line and the impact it’s made beyond athletics. Groundhog Club Inner Circle member John Griffiths joins Tim to talk about Groundhog Day and why a little town called Punxsutawney becomes the epicenter of weather prognostication one day a year. John is the handler of Punxsutawney Phil, the Pennsylvania ground hog famous around the world for predicting whether or not we have another 6 weeks of winter. February 2nd is better known as Groundhog Day. Aja Romano, a culture staff writer for Vox, joins Tim to discuss the impact AOL Instant Messenger had on the way we communicate and on many peoples’ formative years. The two talk about those colors, those sounds, the dos and don’ts of AIM ands the legacy it left for social media habits we carry on today. Alexis McCrossen, a professor at SMU and an expert on how cultures have marked time in history, Joins Tim to talk about our New Year’s Eve traditions with a special focus on the story behind that Times Square Ball Drop. Author Gerry Bowler joins Tim to discuss the story of Santa Claus. Gerry is the author of the book entitled, “Santa Claus: A Biography.” He talks about everything from Santa Claus’s birth and evolution over the centuries, to his role in modern day culture. Santa Claus the philanthropist, Santa Claus the gift giver, and Santa Claus the ad man. Writer, editor, producer and actor Jason Liebig joins Tim to talk about the Sears Wishbook. Jason is the creator of a website called WishbookWeb.com, which has archived complete, high-quality scans of Sears Wishbooks and other holiday catalogues going back to 1933. In this episode, we talk about a holiday tradition sure to bring a smile to your face. Author Danny Graydon joins Tim to talk about the classic cartoon The Jetsons and how a children’s television program from the 60s could have had such staying power after only one season, and some of the many visions of the future depicted in the show. What’s our progress been towards becoming the world of The Jetsons? John Chamberlin joins Tim to talk about something we may take for granted, that is until we need it. It’s the story behind those helicopters that swoop in to take critically injured or sick people to the hospital care needed to save their lives. John is a co-host at the popular Pittsburgh podcast called YaJagoff, and over the years has served as an emergency medical responder. He remains an active advocate for that community. In short, this episode is about hope that didn’t exist before, all thanks to a wingless aircraft. Author Robert Grippo joins Tim to discuss the story of the most famous parade in the world, the Macy’s Thanksgiving Day Parade. Robert and Tim talk about the parade’s history, its role as perhaps one of the most notable PR events ever, and how the event has become ingrained in America’s consciousness and the official kick-off of the nation’s celebration of the Holiday Season. John Wall, marketing veteran and co-host of the popular podcast Marketing Over Coffee joins Tim to discuss the story behind Black Friday and Cyber Monday and their impact on the holiday shopping season, marketing and the economy. Where did Black Friday get its name? How much do people spend on the first weekend of the holiday season? Find out. Writer, producer and director Sharon Grimberg joins Tim to discuss her latest production for American Experience on PBS called “The Circus.” Sharon talks about how the circus played a unique role in introducing Americans throughout the country to the world beyond, and in the process, helping to define American culture, and feed a growing nation’s imagination. For many decades before mass media, the circus brought to your town sights, sounds, smells, a complete sensory experience you might only get one day a year, if not once in a lifetime. World-renowned concussion expert Dr. Michael “Micky” Collins joins Tim to discuss his pioneering work in the diagnosis and treatment of concussions, and the role that public education and awareness has played from the very start. Dr. Collins talks about myths, realities, how perceptions have influenced football and sports participation. Then he gives his vision of where it goes from here. Business writer and author Jeff Haden joins Tim to tell the story of Beats. Those expensive headphones that are about more than sound. They’re fashion statement. Jeff is a contributing editor for Inc..com, and he’s the author of the book, The Motivation Myth: How high achievers really set themselves up to win. Today, we look at a case study on winning in business in the high-end headphone market and how it changed the way we look at sound. The premise of our podcast is simple. We talk about the people, events and things that have shaped the way we think. In this episode, John tells the story behind the car that some vintage collectors say is an iconic American symbol of freedom, but all describe it in one word – cool. Researcher Dr. Eva Lee joins Tim to discuss her work on the front lines in the battle against the opioid epidemic. Dr. Lee is a professor in the School of Industrial and Systems Engineering at Georgia Tech, and Director of the Center for Operations Research in Medicine and HealthCare, and her not-so-secret weapons are math, data and analytics. Former FBI special agent Bill Crowley joins Tim to discuss his role as the FBI’s lead spokesperson on the scene in Shanksville, Pennsylvania in the days following the Flight 93 hijacking and crash on September 11, 2001. Bill talks about his own role, the crisis communications challenges and takes us back to that time and that place. Journalist and author Eleanor Foa Dienstag joins Tim to tell the story behind the humble Heinz Ketchup bottle in our fridge, its journey to our hearts and homes, and the people who made it one of the most iconic food brands in America. Historian Liz Covart joins Tim to discuss the events and circumstances that led to the American Revolutionary War, and the stories behind the actual drafting of the most revolutionary document ever written, The Declaration of Independence. Liz, who is also the host of the popular Ben Franklin’s World podcast, talks about the Declaration of Independence as a living, breathing document that is as relevant today as ever.